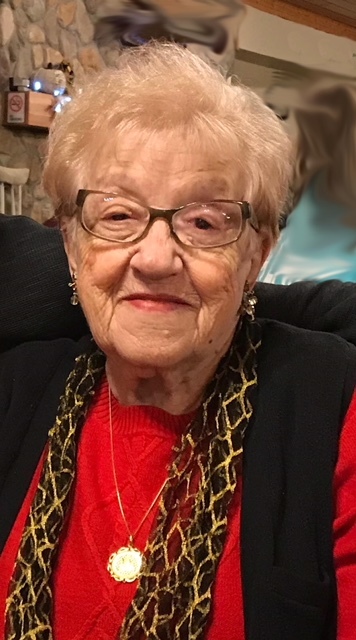 Claudia Mangano, formerly of 47 Woodworth Ave., Jamestown, died Sunday, April 14, 2019, at UPMC Chautauqua. A native of Jamestown, she was born Sept. 16, 1923, a daughter of the late Charles and Santa Casalle George. She had been employed as a waitress by the Red Coach Inn and later by the Town Club. She loved entertaining family and friends. It was the joy of her life. An avid crossword puzzle enthusiast, she was always willing to help others solve them. A lifelong member of the Junior Matrons, this organization was centered on helping people in need. She was preceded in death by her husband of nearly 40 years, Joseph Mangano, whom she married July 9, 1977 and who died Feb. 28, 2017. A Mass of Christian Burial will be celebrated at 10 a.m., Wednesday in Holy Apostles Parish, Ss. Peter and Paul Catholic Church. The Rev. Dennis W. Mende will be celebrant. Burial will be in Sunset Hill Cemetery. Friends will be received from 5-9 p.m. today where a Christian Wake Service will be led at 4:45 p.m.